We are pretty sure bats play, but we don’t know what they play! We do know that when they turn up in stadiums, they are lost and scared. Hi everyone! I hope you all had a good week! I had a great one because I had almost no school! The polar vortex closed schools and caused delayed openings. We also got a little bit of snow. The teeny bit of snow caused them to close school on Friday. We have no school Monday because it’s a teacher work day. So, I have a 4-day weekend! And now for the bat news. At an NBA game between the San Antonio Spurs and the Brooklyn Nets, a few surprise guests appeared. A group of bats flew in from an unknown entry point and stopped the game. Security guards ran onto the court and started trying to catch them with a giant net! One member of the San Antonio Spurs, Manu Ginobili, has been known to catch these beautiful creatures. In a previous game of his, a Mexican free-tailed bat flew in and began flying around. Ginobili swatted the bat and gave it to an area attendant. If a creature, like a bat, does fly into your house or building, you should call someone trained to help in these situations. This could be Animal Control or a local wildlife facility. You should never take matters into your own hands unless absolutely necessary. Ginobili did not take the correct measures in safety, and had to get 16 rabies shots afterward. 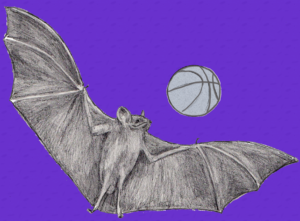 If you would like to watch the videos of the bats enjoying the basketball game, you can do so here. Previous StoryA delightful sac of smell!